When the festive season comes, you need to start planning for a lot of things. You start decorating every nook and corner of your house. You bring home all those beautiful décor items that have hit the market just as the season hits your door. Speaking of the door, you also bring intricately designed beautiful wreaths for your front door. These wreaths add more flair to your door and bring out the fun feeling of festivities. Here are some DIY Wreath Tutorials You Can Actually Put into Use. Using different things such as leaves, burlap or tulle in different patterns you can make some really great wreaths for your door. Make your mind more crafty and get all the glue, scissors, and other accessories that you want to use in your wreath and start making one. Make some cute keychains on your own to give as lovely gifts this festive season. While burlap wreath might sound plain and boring it is anything but that. Burlap wreaths are simple but elegant. And to add more flair to it you can add few things of your choice such as leaves or flowers. All you need is a metal wreath frame, burlap ribbon, floral wire, and scissors. Just take out 10 minutes of your time to make this elegant burlap wreath. Isn’t this heart wreath is simply adorable? You could fix it on a wall of your bedroom. It’s easy to make and will be ready in no time. You just need some a pile of scraps with nearly 8 inches length and 1.5 inches in width. Add a heart wire wreath frame and that’s all. Just keep tying the scraps and the wreath will be ready and you wouldn’t even know it. Make some lovely decor items for your home with these cool ideas. 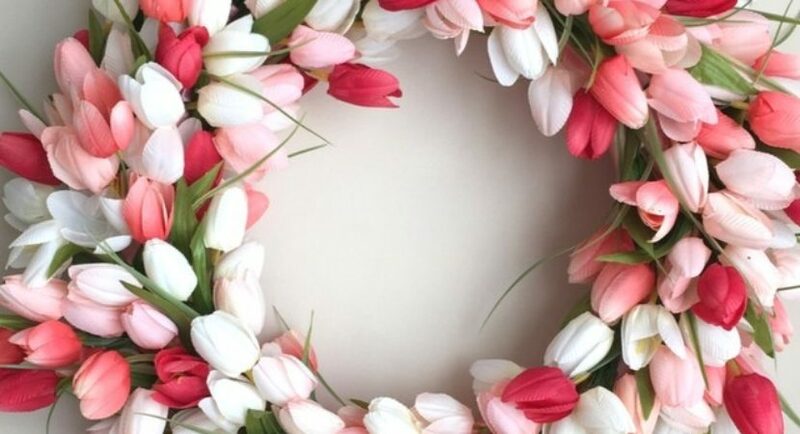 This tulip wreath gives a fresh feeling with its pleasant color and elegant look. To make this tulip wreath you will need a foam wreath frame, a spool of 1.5 inches wide satin ribbon and about 10 bunches of silk tulips. You will need to start gluing the ribbon to the frame and then keep wrapping the tulips around it. Easy, isn’t it. Welcome your guests with an elegant modern fall wreath on your door. To make this beautiful wreath you will need a metal wring, yarn, faux florals, scissors, hot glue gun, floral wire and wire cutter. Here peonies are used but you can use your favorite flower instead. Also, check out these cool winter DIY projects that you should definitely try. This pinecone wreath is perfect for the fall and the holidays that follow this season. This wreath will take nearly just an hour of your time to get ready. Just bring in some pine cones, about 55 to 65 will be needed here, a 12” wire wreath frame, hot glue gun, and hot glue sticks. To add more style to this wreath you can use LED fairy lights too as well as few evergreen branches and berry springs. This Christmas use the stone to make great art pieces for your home. This Halloween, welcome the kids with this cute Halloween ribbon wreath. All you need to make this is a wreath frame and different ribbons varying in shapes and sizes as well as colors. Since the colors used here are chosen with the Halloween in mind, you can choose other colors for different occasions as well. Who would have thought that corns could be used to make the wreath too? This Indian corn wreath is so cute and totally easy to make. Just bring in some mini Indian corns, a straw wreath, and a hot glue gun. The number of multi-colored Indian corns will depend on the size of your wreath that you want to make. A leaf is never more beautiful than when it changes the color when the fall comes. This DIY fall leaf wreath is made simply using fall oak leaves, grapevine wreath frame and scissors. You can use the real preserved leaves that you could get from the craft store easily. A big bunch of oak leaves will be enough to make this fall leaf wreath. P.S. If you love to catch memories in the scrapbooks then this is something that you must see. There’s no such rule that these wreaths should be fixed only on the doors. You can hang them on a wall too. But while making the wreaths you must be sure where you do want to use it. Because don’t you think the fall leaf wreath will look a little out of place in your bedroom. Wink! So decide where you want it and start making your wreath. Learn some DIY canvas art while you are in the mood for art and craft.